When it comes to state government, the real fireworks might not happen until after July 4. After five contentious months, Wisconsin Republicans are gearing up for a tough fight. Gov. Scott Walker recently told supporters that he expects organized labor to pour $20-25 million into the upcoming recall elections. So far the Government Accountability Board (GAB) staff has recommended that recall elections be held for three Republican senators. The Board will make a final ruling next week. The GAB staff will make recommendations by early June for six more senators for whom recall signatures have been collected, including three democrats and three republicans. Elections would be scheduled for July 12, presuming no further legal challenges to the Board’s decisions arise. Recall candidates have raised more than $1.3 million for recall campaigns in recent months. Sen. Alberta Darling, the only Milwaukee area senator to face a recall election, has raised $421,940, the most money of all recall candidates. Darling has opened a new office on Silver Spring Drivein Glendale for the recall election. Rep. Sandy Pasch (D-Whitefish Bay) has said she will oppose Darling. It is difficult to keep up with all the news coming out of Madison. Much is still in play and Wisconsin’s future is in suspended animation. July’s expected recall elections will determine whether Walker’svision of a vastly downsized state government will become a reality. Meanwhile, some Democrats are concerned that the new Voter ID law provisions may confuse and alienate voters in the upcoming recall elections scheduled for July 12. Voters will not be required to have an ID for the election, but they will be asked to produce one and warned that they willnot be able to vote in 2012 without one. There are other provisions in the Voter ID bill that may affect the outcome: voters will need to sign a poll book, and they must be residents of the district where they are voting for 28 days before the election. They can still vote at their former address if they haven’t been residents of the new district for 28 days. In addition, absentee voting now ends on the Friday before the election (instead of Monday), and the period for absentee voting in person has been reduced from three weeks to two weeks. The Legislative Fiscal Bureau estimates the cost of implementing the Voter ID lawat more than $7 million. The Legislative Fiscal Bureau recently adjusted estimated tax revenues for 2011-2013 by an additional $636 million. Walker has said he does not want to see any of that revenue used to soften the impact of the proposed budget cuts. But other Republicans have said they would like to see some of the money used to continue Senior Care benefits for prescription drugs, and to reduce the cuts to education. Educators, health care professionals, local government officials, environmentalists and advocates for seniors have gone hoarse in recent months decrying the proposed cuts. The budget proposes cuts of more than $800 million for education, $900 million for health-related programs, $96 million to local communities (along with a mandate not to raise local taxes), $10 million for mass transit and $64 million for recycling. Walker has backed down from the recycling cuts because they proved to be so unpopular. Darling opposes the Walker plan to put general tax money into the transportation fund and is opposed to using this money to pay for highways. Walker’s plan calls for using $115.4 million in general revenue bonds to pay for highways and proposes to pay for bus and transit out of the general fund. Historically, roads, bus and other transit have been paid for by using gas tax revenues and vehicle registration fees. Darling, however, does support the plan to pay for bus and transit out of the general fund. Lawmakers are trying to replenish the $1.3 billion that was drained from the transportation fund during the Doyle years. The use of transportation monies for education had bipartisan support during the Doyle years. An amendment to the state constitution has been proposed to prevent such a practice in the future. The provision of the bill to limit collective bargaining rights could jeopardize $45 millionin federal funding for bus systems around the state because federal law requires those bargaining rights to continue in order to receive federal funds.It would not affect Milwaukee Country Transit System because it is a private company whose union employees do not negotiate with the state, but it could affect mid-size cities such as Madison, Green Bay and Kenosha. After promises not to raise taxes in Wisconsin, the biennial budget proposes an effective $8 million increase in property taxes for middle class families by reducing the homestead tax credit for people making less than $25,000. Some 247,000 homeowners and renters would be affected. In addition, the budget proposes to eliminate $41.3 million in tax relief for low-wage workers with children by cutting the earned income tax credit. 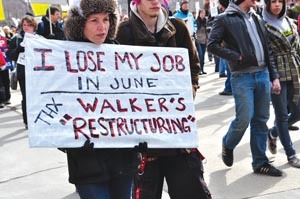 Early in 2011,Walker signed into law tax cuts for corporations and high income individualstotaling some $117 million. Walker also turned down an $810 million federal grant to develop a high-speed railroad linking Madison, Milwaukee and Chicago, which eventually would connect Wisconsin to a national high-speed train network. The estimated annual cost forrunning the line was $7.5 million, which Walker considered cost-prohibitive. These costs were his stated reason not to take federal money while he was on the campaign trail. He made good on his campaign promise in early January. Later it was revealed that 90% of these costs would have been reimbursable by federal offsets. The US Department of Transportation recently rejected Walker’s request for $150 million to upgrade the Hiawatha line. US Transportation Secretary Ray LaHoodsaid preference in awarding the funds was given to states that were committedto developing high-speed rail. There are a couple of additional Walker proposals that seemto be reaching their conclusions, pro and con. The budget proposal to separate UW-Madison from the rest ofthe UW System does not have enthusiastic support on either side of the aisle and may undergo some modifications. There is bipartisan consensus that more time and consideration need to be given to this proposal. Last week the Legislative budget committee recommended that funds for The Knowles-Nelson Stewardship Program that buys land for recreation and preservation be cutby $26 million. It also recommended that funds for Planned Parenthood be cut by$1 million. Ethridge and Associates, a conservative polling organization, pitted Walker against former US Sen. Russ Feingold in a recall gubernatorial election and found the two tied. Sen. Herb Kohl announced he will step down in 2012. After much speculation, Rep. Paul Ryan (R-Janesville) has announced he will not runfor Kohl’s seat; sources close to former Gov. Tommy Thompson now say Thompson will run. No Democrats have yet stepped forward. In Wisconsin, a March poll by The Wisconsin Policy Institute found 53 percent of the respondents had a somewhat or strongly unfavorable opinion of Walker while 43 percent had a somewhat or strongly favorable opinion of him. In November, whenWalker was newly elected, a similar poll found 45 percent had a somewhat or strongly favorable opinion of him while 35 percent had a somewhat or strongly unfavorable opinion of him. Approval ratings of newly elected Republican governors in Ohio and Florida have also plummeted.